18ct Sparkling Water Variety Pack $8 Shipped! 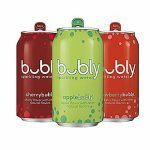 This 18-Count Bubly Sparkling Water Variety Pack is selling for $8.24 at Amazon.com. Other retailers are selling this for $17-$22.